List of the major international airports in the United States and Canada. 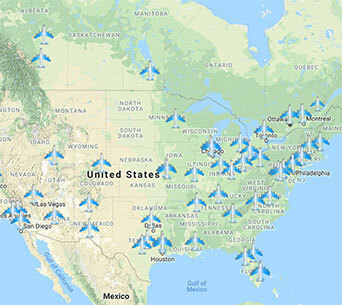 The largest, most busiest and most important airports of the US and Canada are listed. Find maps, links and IATA airport codes and airport's passenger statistics on this and the following pages. To find more information about an airport and its location on a map use the respective Location: City link. You may also use the map to the right, with short information and passenger statistic for the individual airport. For the major US Airports, Air Traffic Control System Command Center provides constantly updated general airport conditions.